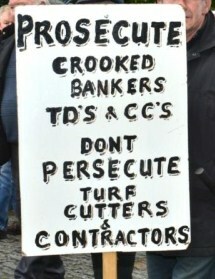 On 9 March 2012 four-and-a-half thousand working people took part in an agrarian-style demonstration outside Leinster House organised by the Turf Cutters’ and Contractors’ Association. 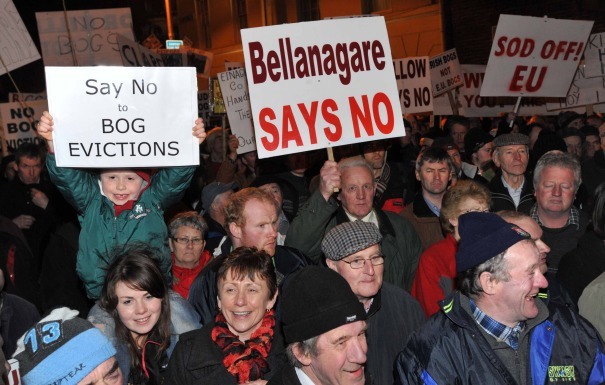 As a result the Dublin parliament passed a motion tabled by Luke Flanagan TD in support of the turf-cutters and for a national raised-bog restoration plan. Having previously rejected the turf-cutters’ case, the Government promised to organise a delegation to travel to Brussels to meet the EU Commission in an attempt to resolve their grievances. This was not to be, as the Government simply reneged on the commitment made to the turf-cutters. The Kildare Turf Cutters Association (KTCA) including representatives from Mouds Bog (SAC), Ballynafagh Bog (SAC), Hodgestown Bog (NHA) and Black Castle Bog (NHA Edenderry) met with three executives of the National Parks and Wildlife Service (NPWS) at Sarsfields GAA Clubhouse on May 1st 2013. It was explained that the KTCA was attending the meeting under protest, to a great extent, as many members did not see any merit in the meeting, but that the KTCA would not give it to Minister Jimmy Deenihan to proclaim that the KTCA was in some way unreasonable and would not meet him or his agents. The meeting lasted for three hours and the position of both sides on many issues was clarified. The first piece was written by D.R. O’Connor Lysaght, a long-time Irish Marxist activist and writer, associated with Socialist Democracy. (I assume he is still a member, but I’m not totally sure.) He sent the article to the blog via a mutual acquaintance. Since I want to encourage contributions from a viewpoint which is both socialist and recognises the centrality of the national question, I’m running Raynor’s piece along with a second view from myself. I’d also encourage folks to read éirígí’s own report and watch the video of the Dublin commemoration (both here). 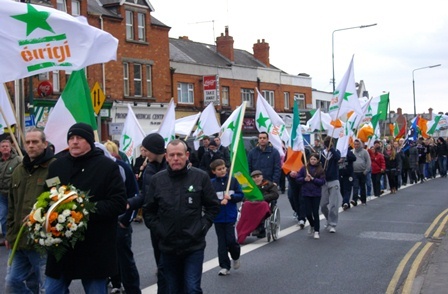 Eirigi’s Dublin Easter Commemoration was impressive. Despite a last blast of the coldest recorded March weather, at least a hundred people of all ages, more than on the previous years, came to parade and listen to the orations. But what message went forth? By now, this writer has enough experience to distinguish the cover of the rhetoric from the core meaning. Here he came away having seen a movement groping its path in a generally progressive direction. Brian Leeson’s keynote presentation was a significant advance on that which he presented at éirígí’s conference eighteen months ago. It was a blistering attack on capitalism from the standpoint of that mysterious force Socialist Republicanism. Such rhetoric has been used in the past all too often to cover the abandonment of the revolutionary core of Republicanism with the verbiage of social concern; it was a technique of Official Sinn Fein before it proclaimed itself the Workers Party. Leeson’s speech was different; if it emphasised the economic crisis, this was particularly proper in Dublin. 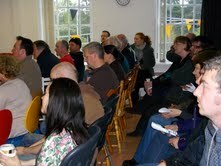 On Wednesday 2nd May 2012, a meeting took place entitled “The EU Permanent Austerity Treaty: is it economic suicide?” at the Liffey Studio in Newbridge, County Kildare . A standing room only crowd came to hear artist and veteran activist Robert Ballagh of the People’s Movement and John Dore, PRO Kildare Turf Cutters Association. 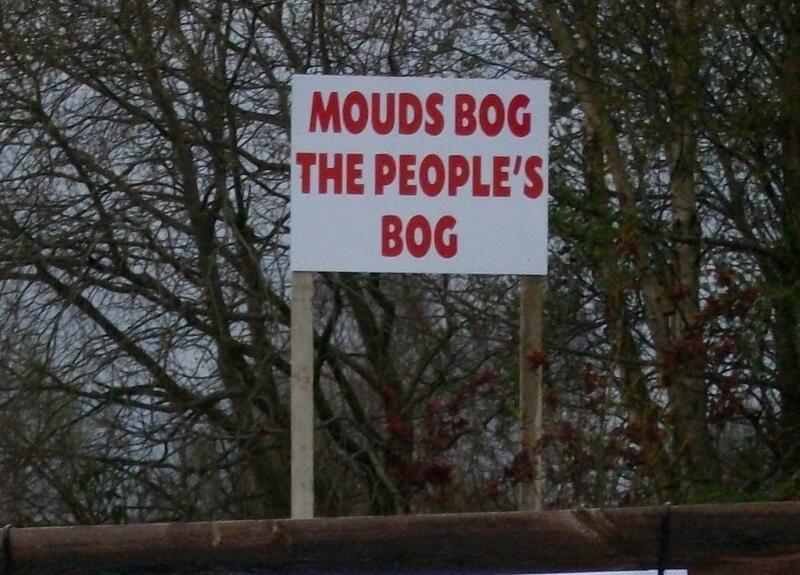 The large turnout from the people of Kildare seemed to reflect the concerns about the Austerity Treaty. Having previously rejected the turf cutters’ case, the government promised a delegation to travel to Brussels to meet the EU Commission. However, this approach floundered in Brussels, the EU insisting that turf cutting must stop. One of the most important developments in the last 18 months in the twenty-six counties has to be the resistance of turf cutters to the EU directive that banned turf cutting. On March 9, several thousand people took part in a protest outside Leinster House organised by the Turf Cutters and Contractors Association, some travelling from as far away as Kerry, Clare and Cavan. They carried placards saying “No to EU bog evictions and no to EU dictatorship”.